Meet our cheerful new cast of 3D car characters learning colors in these non-stop cartoons for kids. Our colorful 3D car cartoons will help your toddler learn colors, numbers, and shapes in a fun and happy way! 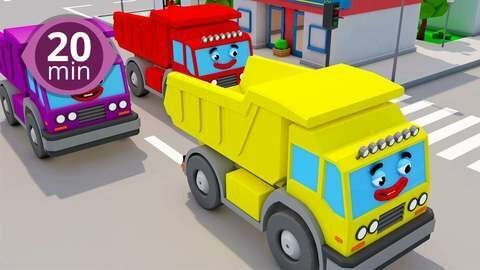 From Red Fire Truck and Orange Dump Truck to Yellow Sports Car and Blue Police Car, our 3D car cartoons will entertain and educate your preschooler with their fun adventures. And there's more to come! Through popular nursery rhymes like The Wheels on the Bus and Finger Family, our cheerful cast of 3D car characters will help your baby learn colors in a fun and stress-free way! Watch Orange Garbage Truck clean up the town, see Yellow Sports Car find his special parking space and watch Blue Police Car get a bright new paint job. Our 3D car cartoons will entertain boys and girls with fun adventures while teaching all-important first skills of the early learning years. Enjoy the best full episodes online for free at SeeZisKids!